Edwin G. Burrows. 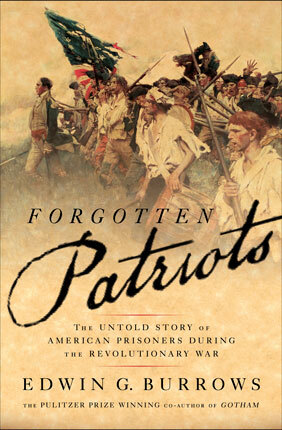 Forgotten Patriots: The Untold Story of American Prisoners During the Revolutionary War. New York: Basic Books, 2008. Pp. 384. ISBN: 0465008356. $27.50. Edwin G. Burrows is the Pulitzer Prize-winning co-author of Gotham: A History of New York City to 1898 and Distinguished Professor of History at Brooklyn College. He has also authored numerous articles, introductions and chapters in books focusing on early American history and the history of New York. In his new book, Forgotten Patriots: The Untold Story of American Prisoners During the Revolutionary War, Burrows uncovers the tragic story of the more than 30,000 American prisoners of war held by the British in New York during the course of the American Revolution. Burrows’ research makes admirable use of prisoner manuscripts and narratives, contemporary newspaper accounts, official documents, reports, letters and correspondence from both American and British sources. The book contains copious notes and careful evaluation of sources throughout. Several conclusions lie at the heart of Forgotten Patriots. Chief among these is the incredible scope of the numbers of prisoners involved. Although a definitive count is impossible to achieve, Burrows estimates that perhaps as many as 32,000 Americans were held prisoner by the British over the course of the war. What is most striking is that perhaps more than 60 percent of these individuals, some 18,000 souls, perished in captivity. British abuse of American prisoners began early on. During the Battle of Brooklyn at the end of August 1776, less than two months following American independence, British and Hessian troops captured somewhere between one- and two- thousand prisoners. Provoked by their scorn for the rebels, enemy troops beat, robbed and murdered men who had surrendered to them. Meanwhile, the British had captured so many Americans that they did not have the logistical support needed to confine and provide for them. Throughout the war, British logistical problems were so baffling that their own troops often served on short rations. As a result, American prisoners got the smallest portions of the worst food—scraps of soiled pork, wormy bread and brackish water—if they got fed at all. Starvation was so rampant that stories abound of men gnawing at their own flesh or trying to eat bricks to keep from starving to death. Severely malnourished and afflicted with lice and vermin so extensive that captives’ clothes were literally eaten off their backs (before the bugs began to devour their flesh), detainees were highly susceptible to scurvy, smallpox and other deadly diseases. Prisons were so overcrowded that dysentery grew rampant as the men had no room to move and were forced to relieve themselves on the floor where the sick and dying lay. Dead bodies “piled up like sticks of wood,” and burial details regularly disposed of ten, twenty and sometimes thirty corpses each morning. A number of prisoners reported watching the city’s loose swine devour the flesh of the dead lying in uncovered heaps in prison courtyards. Although supply problems accounted for some of the abuse, most of the brutality stemmed from the fact that the Royal high command had serious trouble deciding whether or not rules governing prisoners of war applied to rebels; men who in British eyes deserved to be strung up as traitors, pirates and outlaws in order to end the insurrection as quickly as possible. Consequently, prison commanders and guards tortured and punished captured rebels at will leading to terrifying scenes of sick, naked, and starving captives forced to suffer the terror of squalor, rampant disease, brutal guards, horrendous food, awful pain and death. The most unfortunate prisoners were those confined on the dreaded prison ships: broken-down British warships anchored in Wallabout Bay. Captured Americans, mainly privateers, but military and civilians captives as well, were crowded into the boarded-up holds of these ships like “wild beasts in small, stinking apartments” where possibly as many as 11,000 prisoners died during the course of the war. The single most widely recognized symbol of British cruelty was the Jersey, which in essence was nothing more than a floating pit of nightmares and death. Relying heavily on carefully scrutinized contemporary accounts, Burrows’ description of the horrors suffered by American prisoners makes the reader’s flesh creep with a disgust and horror that is hard to express. Although “it is a mean, ugly story” the book greatly enlarges our understanding of how our nation was born. Building on work of other historians such as Sung Bok Kim and Barnet Schecter, Burrow places New York City and its environs at the center of the Revolution as he points out that more Americans suffered and died in the cause of American independence here than in any other place. What Forgotten Patriots does best, however, is remind us of the enormous price that many Americans paid for a cause they deemed more important than themselves. In so doing, Burrows explores the impact that the Revolutionary War had on the development of our nation’s early commitment to hold ourselves to a higher standard and “treat future prisoners of war with decency and humanity.” A lesson unfortunately, like the prisoners of the Revolution themselves, we at times forget.